Nowadays, smartphones and tablets are part of everybody’s basic equipment. Who can imagine our western world without using them for communication? Ultimately, this leads to a new problem we all have to face: the electromagnetic spectrum is a limited resource and the demand for it is increasing. 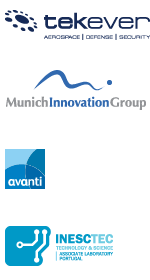 The European Union, along with industry partners identified this challenge and integrated corresponding initiatives into the Europe 2020 strategy. “Europe 2020”, the strategy of the European Union for economic growth, aims at a sustainable, integrated and innovative economy for all member states. As part of this strategy, the Horizon 2020 program is addressing the research and innovation projects to establish a solid base for economic leadership in Europe. Running under the section “Leadership in Enabling and Industrial Technologies”, the project “Space Cognitive Radio for Electromagnetic Environment maNagement” (SCREEN) belongs to the Horizon 2020 portfolio and aims at implementing the cognitive radio concept in space. SCREEN addresses the conflict that originates from the increasing spectrum demand and finite bandwidth. The consortium will make use of the key enabling technology, Software-Defined Radio, as well as terrestrial research results in cognitive radio at all levels (technology, market and regulation). This approach allows SCREEN to build on previous work, avoid duplication of efforts and support the implementation and testing of cognitive radio in space at S Band. The overall goal of SCREEN is to use available frequencies more efficiently and, hence, provide a promising solution for satisfying future spectrum demand. SCREEN Brochure is available here for download. The work presented herein has been funded by the European Community's Horizon 2020 Programme (H2020) under Grant Agreement 640210. 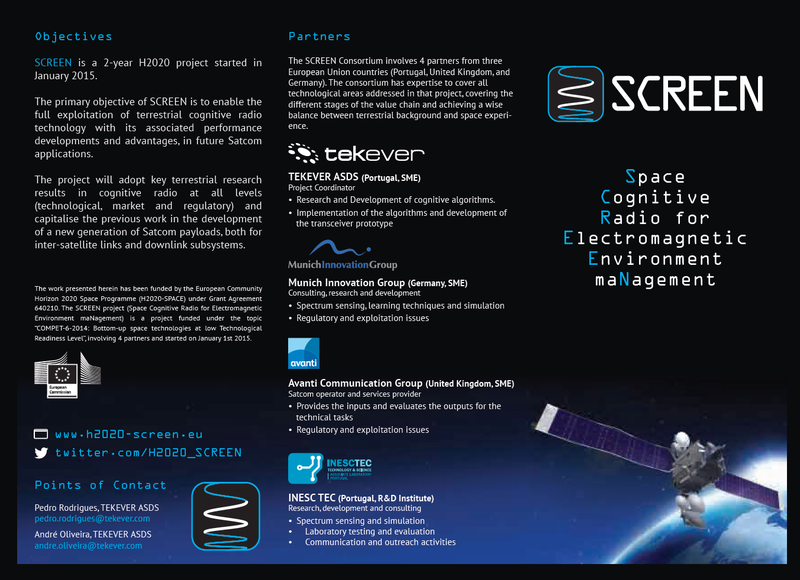 The SCREEN project (Space Cognitive Radio for Electromagnetic Environment maNagement) is a project funded under the topic COMPET-6-2014: Bottom-up space technologies at low TRL, involving 4 partners and started on January 1st 2015.